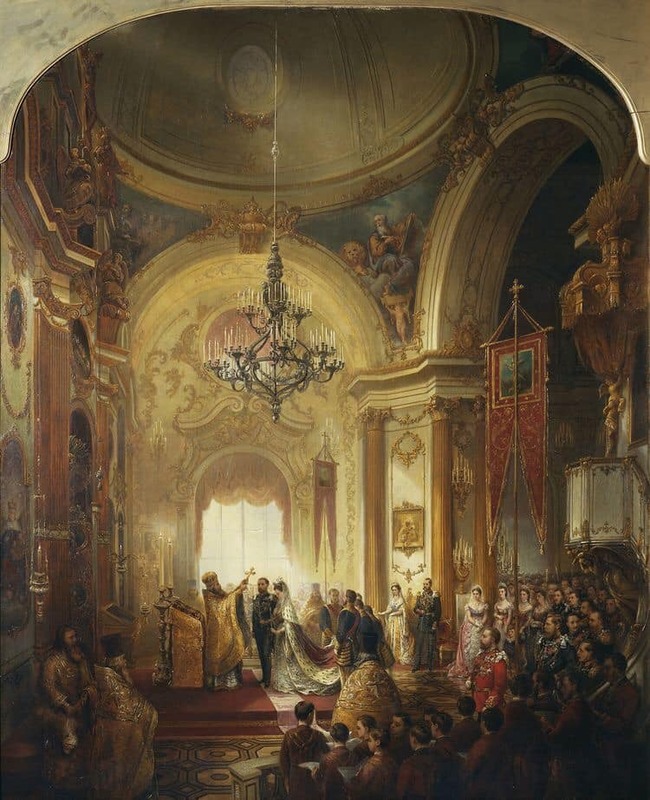 Prince Alfred, Duke of Edinburgh, second son of Queen Victoria, and Grand Duchess Marie Alexandrovna of Russia, only daughter of Emperor Alexander II, were married today at noon in "the presence of a vast assemblage of guests in the Winter Palace," reports the New York Times. The women were "sumptuously attired," with many of the female guests in Russian costume, "mainly velvet and diamonds." The men were dressed in inform with the exception of the American ambassador. The procession began with "grand equerries and Chamberlain's officers of the court," who were followed by Emperor Alexander II and Empress Marie, the Prince and Princess of Wales of Wales, Crown Princes of the German and Danish royal houses, Prince Arthur, the groom's younger brother and the bride and bridegroom. The Duke of Edinburgh was dressed in a naval uniform. The bride was "splendidly appareled in a long crimson velvet mantle, trimmed with ermine and wore a diamond coronet." Her train was carried by four pages. The Princess of Wales wore a gown of "dark crimson velvet with a diamond coronet and collar and pearl necklace. The Crown Princess of Prussia was dressed in a similar style. The Metropolitan head of the Russian church greeted the procession at the church door. Alexander II escorted the bride and bridegroom to the middle of the church. He was joined by the Empress as they stood behind the couple. The wedding rings were carried on golden salvers and placed on the altar. The "magnificent chapel was illuminated with innumerable wax candles, the floor covered with a velvet crimson and gold carpet, the pillars and altar covered with gold." The Orthodox ceremony was devoid of music, replaced by "chants and intoned prayers." Crowns were placed over the heads of the bridal couple. Prince Arthur held the crown over the Duke of Edinburgh. Grand Duke Serge, the bride's brother, held the crown over her head. "Thou servant of God, Alfred Ernest Edward, are crowned for this handmaiden of God, Maria Alexandrovna, in the name of Father, Son and Holy Ghost." Prince Arthur became tired from holding the Crown and looked relieved when he was able to put it down. The married couple walked three times around the raised dais, "holding to the tip of the confessor's robe and a candle in the other." At the end of the ceremony, the Sacramental Cup was brought to the couple, where both sipped the wine. The cross was presented to them, which both kissed. After the Orthodox service was ended, a new procession slowly formed, proceeding to the Hall of Alexander for the Anglican service, Dean Stanley of Westminster Abbey officiated at the ceremony. Grand Duchess Marie stood between her father and the Duke of Edinburgh, Prince Arthur stood behind them. Empress Marie, a confirmed invalid, was feeling fatigued during the English service and had to sit down. She was "overcome with emotion, holding her handkerchief to her eyes, when the married couple came to salute her." There was some criticism of the bridegroom's appearance as his "reserved and solemn manner created an unfavorable impression." The Prince and Princess of Wales' "affability was cheered" when they arrived at the church. The two services were followed by a banquet at the palace. The opera singer, Mme Patti sang for the guests. These evening a ball, which was attended by the Emperor, was held in St. George's Hall. The New York Times's reporter noted that there was a "limited display of popular enthusiasm at the illuminations in the public squares." The new Duchess of Edinburgh is the fifth of seven children. She was born on October 17, 1853. The Duke of Edinburgh, who was born on August 6, 1844, is the second son and fourth child of Queen Victoria and the late Prince Albert. The Slavonic and East European Review. Thanks for the referral to the article The Slavonic and East European Review. It will give me something to read on the commute home from work.